Arduino, along with Raspberry Pi, are the brains of Maker projects! Arduinos are small, cheap computers designed to make working with sensors, LEDs, motors, and other electronics components as easy and painless as possible. They come in a range of sizes, from small to REALLY small, and with a range of features, such as built-in game controllers, WIFI, Bluetooth, USB, etc. Also available are "Arduino Shields," stackable modules that expand the functionality of your arduino with motor controllers, touchscreens, radio, synthesizers, and more. The Maker Hub's supply of Arduinos varies, but we mostly stock UNOs, Lilypads, and some other variants, and well as an assortment of shields. 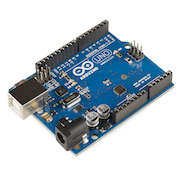 Arduinos are programmed with the simple Arduino IDE, available here: https://www.arduino.cc/ (Mac, Linux or Windows). Check out the Maker Hub's workshop pages for upcoming Arduino classes!